The GDC staff are big fans of the Bismarck State College Mystic Marketplace. If you aren’t on campus frequently or don’t know much about BSC, the Mystic Marketplace is the dining hall. The food is great and the staff are very nice people, plus, they have free ice cream on Wednesdays and Fridays. 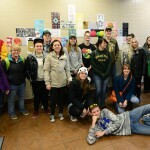 Food Services Manager Mike Wavrin pointed out a few weeks ago that the wide open tile walls were begging for art work, so we put the freshmen GDC students to work fixing that problem. 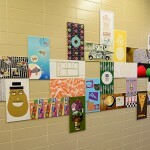 Each student piece is the same size – 7 3/4 inches by 15 1/2 inches, half of the students did a vertical layout and the other half had to use a horizontal design. Students were further constrained with a design style, possibly using other students’ thumbnail sketches or a continuous line drawing. Some students were limited to only working with type, others had to use photos for their piece. The finished wall looks great and the Mystic Marketplace staff has been very complimentary. The students like it too – most stuck around and shot a photo of the installation. This entry was posted in Creativity, Exercise, Graphic Design and Communications by admin. Bookmark the permalink.